Samsung is soon going to launch the new variants of the Galaxy C series smartphones including the Galaxy C5 Pro, Galaxy C7 Pro and Galaxy C9 Pro. Now these three devices has got the TENAA approval in China with model numbers SM-C7018, SM-C5018 and SM-C9008. Samsung has also got the TENAA approval for the new Galaxy On5 2017 variant with model number SM-G5528 that also reveals the images of this new Samsung device. 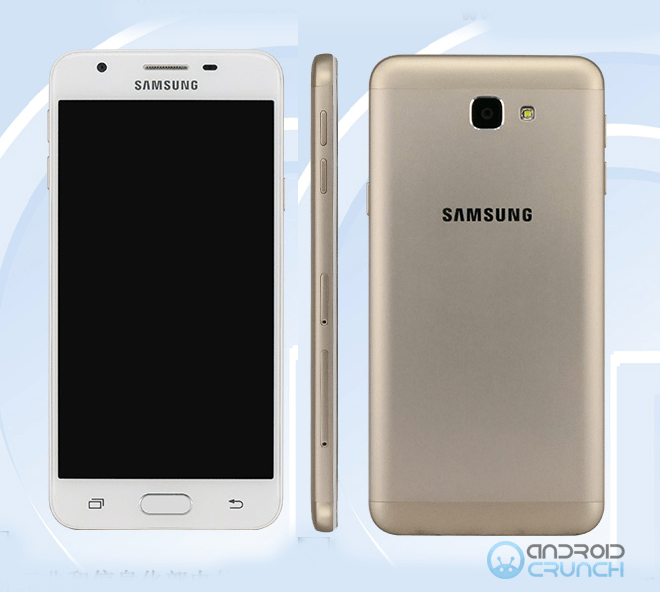 Samsung has already launched the Galaxy c5 Pro and Galaxy C7 pro in India and is also expected to launch the Galaxy c9 Pro in India with the above listed model number. These devices also comes with full metal unibody design and has fingerprint scanner on the front physical home button. The Galaxy C5 Pro is listed at TENAA with SM-C5018 and comes with a 5.2-inch full-HD AMOLED display with 1920 × 1080 pixels resolution and is powered by a 2.2GHz octa-core processor. It comes with 4GB of RAM and has 32GB/64GB/128GB inbuilt storage options. All variants comes with MicroSD card expandable storage up to 256GB. It runs on the Android 6.0.1 Marshmallow OS and is expected to support Dual-SIMs. It features a 16-megapixel rear camera with LED flash and a 16-megapixel front facing camera. It is backed up by a 2600mAh battery and supports 4G VoLTE and other connectivity options. It measures 145.7 x 71.4 x 6.95 mm and weights 145 grams. It comes with black and gold color options. 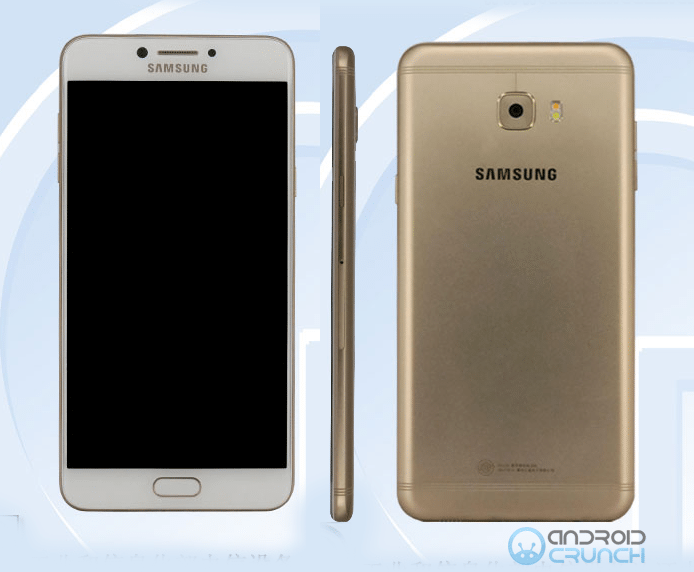 The Galaxy C7 Pro is listed at TENAA with model number SM-C7018. It comes with a 5.7-inch full-HD AMOLED display with 1920 × 1080 pixel resolution and is powered by a 2.2GHz octa-core processor and comes with 4GB RAM with 32GB/64GB/128GB inbuilt storage options with all variants supporting MicroSD card expandable storage up to 256GB. It runs on the Android 6.0.1 Marshmallow OS and is expected to support Dual-SIMs. It features a 16-megapixel rear camera with dual-tone LED flash and a 16-megapixel front facing camera. It is backed up by a 3300mAh battery and supports 4G VoLTE and other connectivity options. It measures 156.5×77.2×7.0 mm and weights 172 grams. It comes with gold color option. 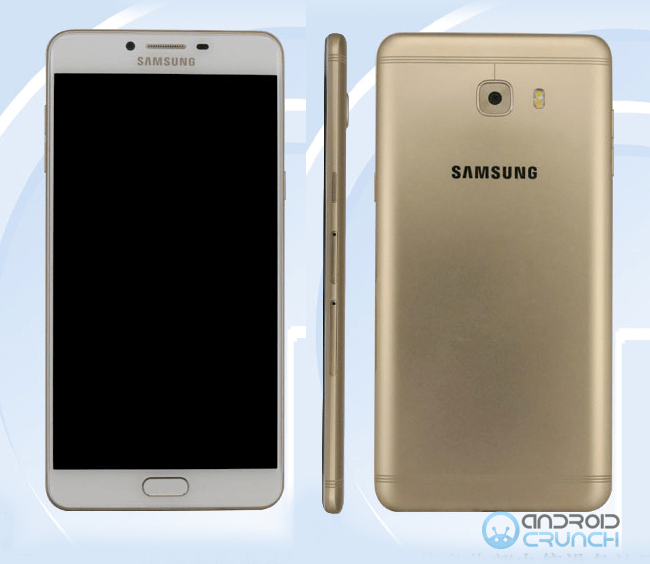 The Galaxy C9 Pro is listed at TENAA with model number SM-C9008. It comes with a 6-inch full-HD AMOLED display with 1920 × 1080 pixel resolution and is powered by a 4 x 1.4+4 x 1.95GHz octa-core processor and comes with 6GB RAM with 64GB/128GB inbuilt storage options with all variants supporting MicroSD card expandable storage up to 256GB. It runs on the Android 6.0.1 Marshmallow OS and is expected to support Dual-SIMs. It features a 16-megapixel rear camera with dual-tone LED flash and a 16-megapixel front facing camera. It is backed up by a 4000mAh battery and supports 4G VoLTE and other connectivity options. It measures 162.9×80.7×6.9 mm and weights 188 grams. It comes with Black and gold color options. The Galaxy On5 2017 is listed at TENAA with model number SM-G5528. It comes with a 5-inch HD AMOLED display with 1280 × 720 pixel resolution and is powered by a 1.4GHz quad-core processor and comes with 2GB RAM with 16GB//64GB/128GB inbuilt storage options with all variants supporting MicroSD card expandable storage up to 128GB. It runs on the Android 6.0.1 Marshmallow OS and is expected to support Dual-SIMs. It features a 13-megapixel rear camera with dual-tone LED flash and a 05-megapixel front facing camera. It is backed up by a 2600mAh battery and supports 4G VoLTE and other connectivity options. It measures 142.8×69.5×8.1 mm and weights 143 grams. It comes with Gold color option.